Lucas Equine crosshatch mesh is the strongest steel mesh on the market. Lucas Equine crosshatch mesh is built with 5/16-inch solid steel rods. These rods are not woven. Instead, they are solidly welded (using arc welding processes) at every single junction. 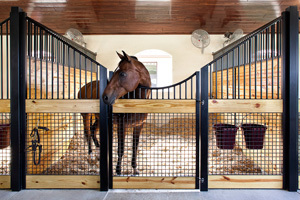 When Penn State University College of Agricultural Sciences recently published a recommendation on horse stable ventilation, they stated the number one thing you could do to improve horse stall ventilation is use open grillwork or grids on front and side stall partitions when possible. We all know that well-ventilated stalls are practical both for their health benefits and their versatility with foals, large breeds, minis, training horses, and others. But, now more than ever, smart consumers are selecting crosshatch mesh stalls that are durable enough to withstand years of abuse AND accentuating them with stylish features like extra-wide center rails, inset bedding guards and beautiful wood accents. 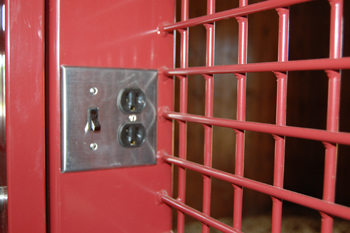 If you've ever had a horse that loves to find a way to cause trouble, you know or have heard of the damage that can be done (to your stalls or your animal) if the wrong type of grid is chosen. Because this terminology is used so interchangeably, it's vital to ask the right questions when purchasing new ventilated stalls and doors or replacing your current ones. 1. What is the thickness of the steel used to create the grid? Lucas Equine Equipment uses 5/16-inch steel rods in our crosshatch, but most manufacturers may use a smaller 1/4-inch steel wire. 4. Can I see a sample? This, perhaps, the most important question. Don't be afraid to ask your builder or stall manufacturer for a sample of the gridwork.